The sad news that Sir Antony Atkinson has passed away was released today. Tributes and reminiscences will no doubt flow this week, focusing on his extraordinary humility and generosity, alongside his lifelong dedication to the study of inequality (whose essence is perfectly captured in Piketty’s review of his last book). I would like to emphasize another aspect of his biography: his key role in the development of public economics from the 1960s onward. His contribution was intellectual (in particular his papers on optimal taxation), educational (he coauthored the most influential textbook of the 1980s and 1990s), and institutional (he was the founding editor of the Journal of Public Economics). Atkinson’s early interest in poverty led him to Cambridge at a time the study of government intervention, then called public finance, was on the verge of a major overhaul. In 1966, as he received his BA, he flew to MIT, where he met two others key protagonists of the transformation of public economics: Joseph Stiglitz, then a graduate student, and Peter Diamond. The latter had just returned from Berkeley, then immersed in the application of duality techniques to microeconomic issues. In the public economics course he had set up with Carry Brown, Diamond was thus teaching duality and how to measure dead weight burden using expenditure function. Atkinson also took Robert Solow’s seminal growth theory course. Back in Cambridge, he pursued his interest in mathematical economics and growth theory, which he blended with a concern for development, the topic James Mirrlees was lecturing about. Frank Hahn was his director of studies. Atkinson would also cite Jan Graff’s Theoretical Welfare Economics (1957) and James Meade’s Trade and Welfare (1955) as nurturing his early interest in welfare issues. These various influences led him to write a dissertation on the reform of social security, poverty and inequality. 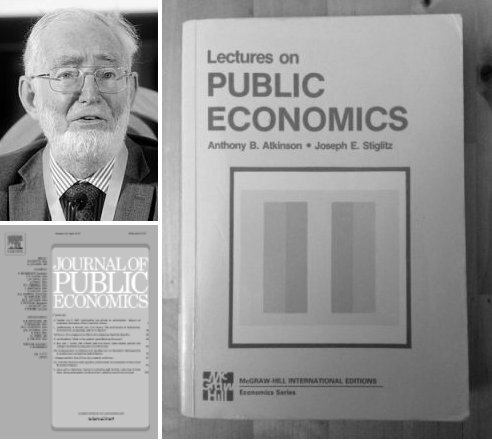 In the Fall of 1967, Atkinson began teaching public economics with Stiglitz, who was then a research fellow at Cambridge. His first lecture opened straight with the two theorems of welfare economics, before going into externalities, indivisibilities, measurement of waste, optimal tax structure, government production, distribution and non convexities. He combined theoretical exposition with figures, though the dearth of data on social security, taxes and government expenditures was a serious hindrance to the growing econometrics research aimed at studying tax incidence of how households and firms reacted to taxation (it was only in the late 1970s, he remembered, that tax data became available for research). It was in these formative years that Diamond and Mirrlees circulated a model of differentiated commodity taxation building on previous work by Ramsey. Their results were immediately integrated and discussed by Atkinson in his lectures. In 1971, he moved to recently founded Essex University. He and Stiglitz began working on the interaction between direct and indirect taxation in the choice of an optimal tax structure. They also aimed at reformulating Diamond and Mirrlees’s taxation efficiency results in a more appealing way for those British public finance economists trained in the Pigovian surplus tradition. Their most famous result, published in 1976, stated that, assuming the utility function is separable between labor and consumption and non-linear income taxation is possible, the government can rely solely on direct labor income taxation (they interpreted capital income tax as a tax on future consumption, one that would distort savings). Their conclusion that, under specific conditions, no indirect tax need be employed spawned decades of debates on whether and under which circumstances capital income tax should be raised. As the time Atkinson accepted Essex’s offer, the science publishing business was booming, and economics has expanded so much that there was a growing need for specialization. North-Holland sounded him about the establishment of a field journal. Atkinson agreed to become editor, and immediately asked Martin Feldstein, Johansen and Stiglitz to join him. They were to handle public expenditures and econometrics studies of taxation, planning & fiscal policy, and the pure theory of taxation and public expenditure submissions respectively. Masahiko Aoki, Guy Arvidsson, Cary Brown, James Buchanan, Peter Diamond, Serge-Christophe Kolm, Julius Margolis, P. Mieszkowski, James Mirrlees, Richard Musgrave, Paul Samuelson, Ethan Sheshinski, Ralph Turvey, among others, also agreed to serve on the board. The unusually high number of associate editors was probably a reflection of the strength and distinctive features of national traditions in the economic analysis of the state, as well as Atkinson’s characteristic desire to combine theoretical and applied perspectives. He was also eager not to cannibalize existing journals on fiscal policy (like the National Tax Journal) or on the regulation of public utilities (like the Bell Journal). He however sensed his new journal would cover new “areas not traditionally included in public finance, and would be more theoretically oriented.” He also wanted to cover “political party decision-making particularly when it is focused on economic decision or when it is based on economic models.” The first issue of the Journal of Public Economics appeared in 1972, with contributions by Johansen, Buchanan and Goetz, Feldstein, Mieszkowski, King, Sandmo, Hellowell, Bliss, Ursula Hicks, and a first paper on the structure of indirect taxation by Atkinson and Stiglitz themselves. He also organized conferences in Essex, Sienna, etc.., which led to special issues of the journal and further community building. Joe wrote more on the theory of the firm, risk-taking and the taxation of investment; I drafted the chapters on general equilibrium. The chapters on optimal taxation grew out of our joint articles, but Joe led on the optimal provision of local public goods (a subject with which I still struggle). But we re-wrote each other’s work and drafts crossed and re-crossed the Atlantic. Until recently I kept on my office wall one page from Joe’s amendments to my chapter, as documentary evidence that mine was not the worst hand-writing in the world! The introductory chapter of the Lectures in Public Economics, eventually published in 1980 by McGraw Hill, makes for a stunning read. The standard for exposition to the field they set has since changed so little that it is difficult to imagine how dramatically different most courses in public finance were in these years. Atkinson and Stiglitz presented the reader with the two theorems of welfare economics. They then listed all sorts of reasons why Pareto-efficient allocations of resources might not be reached: distributional issues, monopolies, missing markets, imperfect information, under-utilization of resources, externalities, public goods, merit wants. These “failures of the market” make room for government intervention, they concluded. The book was divided in two parts: positive analysis of policy, with an overwhelming focus on taxation, and normative analysis with, again, a focus on optimal taxation, and chapters on pricing and public goods. Macroeconomic stabilization was excluded from the book, and two middle chapters summarized recent research on public choice and Marxist theories of the state (voting, bureaucracies, power, interests groups) and welfare economics. Though considered very technical by several reviewers, the textbook became a must-read. By the mid-1980s, it has become the most-cited item in the huge body of literature related to public economics and taxation identified in the Claveau-Gingras bibliometric study of the Web of Science Economics data base, and was still in the top-10 most cited item throughout the 1990s. The original edition was reprinted last year. In their new introduction, Atkinson and Stiglitz explain that, should they rewrite the textbook today, they would only make several additions, including global, behavioral and empirical perspectives, and a deeper coverage of inequality and redistribution. James Meade saw the role of the economist as that of helping design a better society and international order. He chose to study economics in the late 1920s because he believed it ought to be possible to end the plague of mass unemployment, and his last book in 1995 [note: the year of his death] was on the subject of Full Employment Regained? Above all, James had a positive vision for the future. He was, in his own words, ‘an inveterate explorer of improvements in economic arrangements’… he wrote that ‘I implore any of my fellow countrymen who read this book not to object: “It can’t be done.” He was ultimately concerned with what could be done to make our world a better place. Replace “unemployment” by “inequality an poverty,” and you have Tony Atkinson’s life. May our generation of economists live up to his expectations. Note: the material for this post is taken from mail exchanges, interviews and personal archives Tony Atkinson was generous enough to provide. I really appreciate this. Haven’t seen another article that does justice to Atkinson’s work.